Once again, Breguet shows its love for women by devoting the 2017 pre-Basel launch to them. The cutting-edge Tradition collection from Breguet will expand with a new Tradition Dame model (Ref. 7038) attired in rose gold. 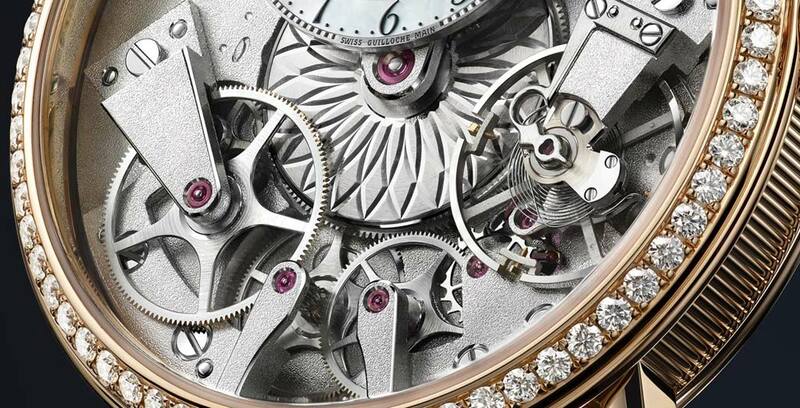 With this self-winding timepiece, Breguet has succeeded in feminising a model whose aesthetic essence lies in mechanical horology, a field that many tend to reserve for men. Clearly visible front and centre of the watch, the barrel is hand-engraved with a rosette motif and overlapped at 12 o’clock by a precious offset dial in natural white mother-of-pearl, finely adorned with hand-crafted engine-turned Clou de Paris hobnailing. Although in full view, the main movement gear trains, as well as the bridges bearing them, remain sufficiently discreet to ensure smooth and instant reading of the hours and minutes pointed by rose gold open-tipped Breguet hands. The retrograde seconds indication is positioned at 10 o'clock while at 4 o'clock it is possible to see the pare-chute, a Breguet invention which protects the balance staff from shocks. Also sometimes called elastic suspension of the balance wheel, the pare-chute (or parachute) is the forerunner of the modern Incabloc and all other shock protection mechanisms. The sandblasted mainplate and bridges are rhodium-plated to create an ideal contrast with the 37 mm rose gold case which is even more precious thanks to the 68 brilliant-cut diamonds (approx. 0.895 ct) set on its bezel. Through the back it is possible to admire the automatic Calibre 505SR and its gold oscillating weight, graced with the same engraved motif as the barrel. Beating at 3 Hz (21,600 vph) and equipped with an advanced balance-spring in silicon as well as an inverted in-line lever escapement with silicon pallets, the movement offers 50 hours of power reserve. Masterpiece! Technique and art in one piece. 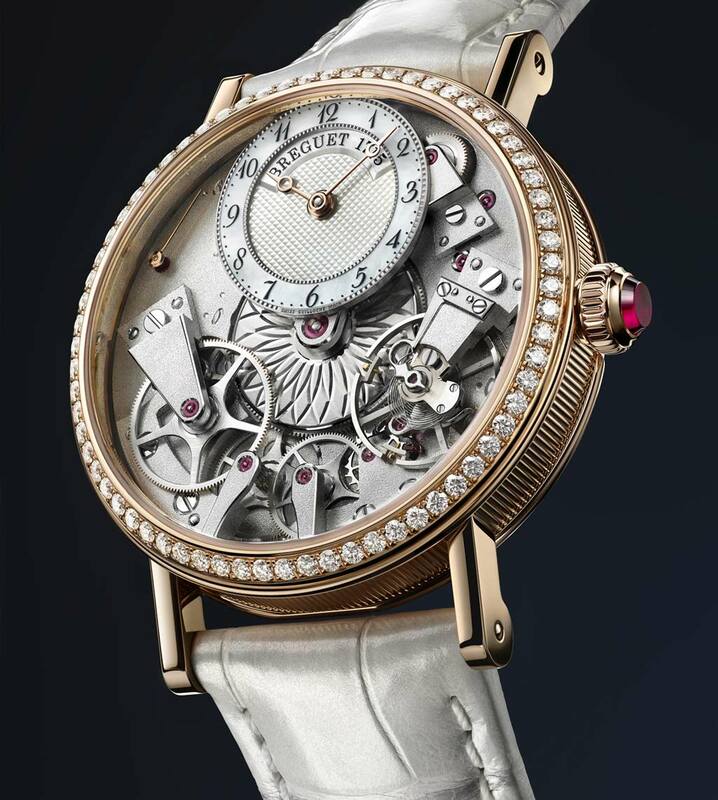 Breguet Tradition Dame 7038. 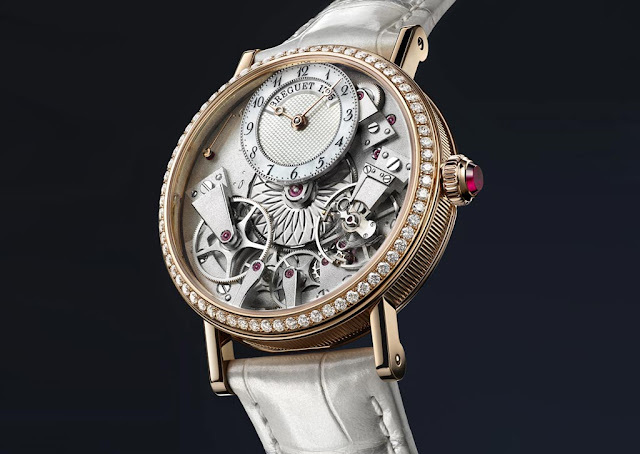 Once again, Breguet shows its love for women by devoting the 2017 pre-Basel launch to them. 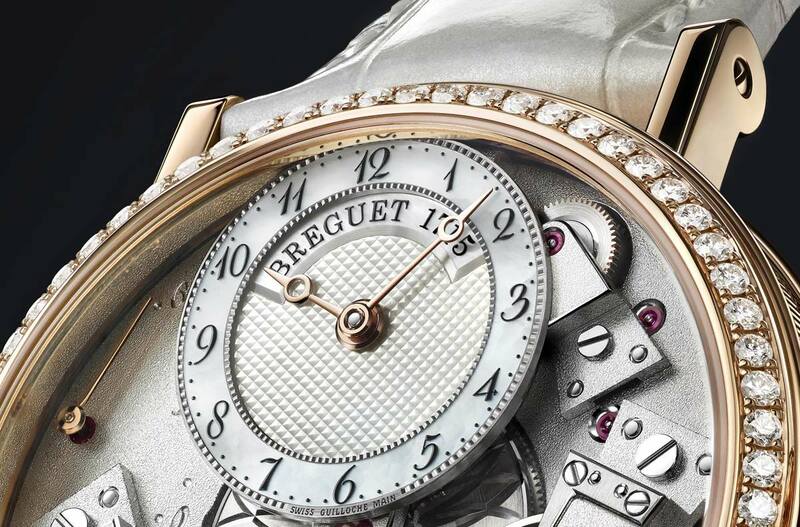 The cutting-edge Tradition collection from Breguet will expand with a new Tradition Dame model attired in rose gold. The crown set with a watch movement jewel and a precious white leather strap add the final touch to this masterpiece of femininity.